One thing I learned from drawing this comic is that owls IRL cannot wear big floppy hats without covering their entire faces. Through the magic of cartooning, the owl’s floppy hat levitates about an inch over her head to allow for maximum visibility. Sometimes, scripting comics comes easily. Monday’s comic sprung, fully formed, into mind, every word in place. Today’s comic script came after a difficult labor, one panel at a time, with no sense as to the outcome. Even after panel 4 was completed, I spent hour staring at it looking for a punchline. 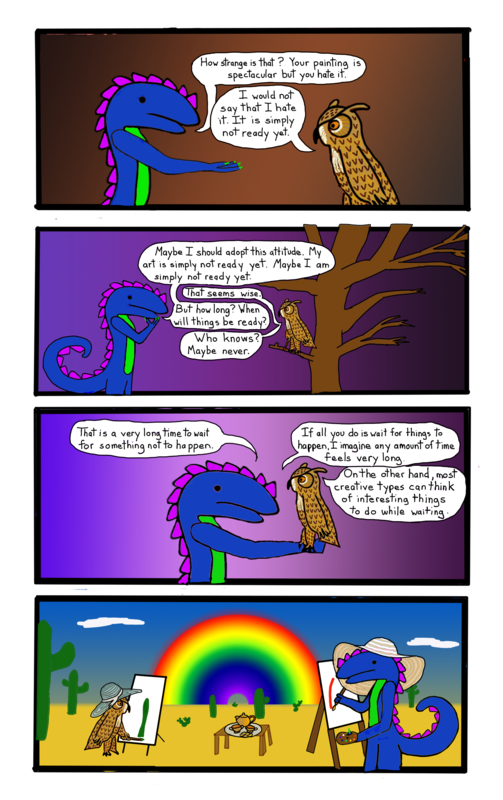 The owl asking if this was better and the dragon concurring. The dragon stating that waiting was actually pretty nice if you knew how to do it. In the end, I’d like to believe that panel 4 is drawn with such palpable joy as to render words unnecessary. The reader can see that the situation has improved; no words are needed. As the year winds down, it’s hard not to reflect. I quit my job at the beginning of 2014 and began drawing all the time. I started this blog and the QvD T-shirt shop. I sold a few T-shirts and a few copies of an embarrassing book whose authorship I don’t like to claim even though I totally wrote it. Finally, I’m living my life in a way that feels more or less authentic. According to the laws of the New Age, the money should follow, right? Not that you go into the arts for the money, but it’s also nice to earn your keep. QWERTYvsDvorak is going on winter break as of now. We’ll be back January 5 with new comics and drawings and T-shirts and hopefully a dragon hat. Have a great holiday! 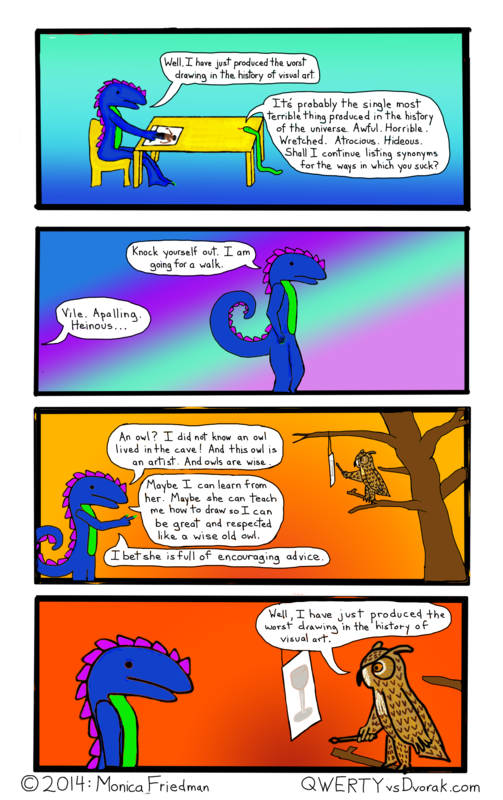 This entry was posted in Comics, Dragons and tagged art, being ready, comic, dragon, dragon comics, drawing, painting, patience, waiting, webcomic on December 24, 2014 by littledragonblue. QWERTYvsDvorak is just about to go on vacation. Wednesday’s Dragon Comic will be the last update of the year, but we’ll return in 2015 with all new ridiculousness for your wasting-time-at-work pleasure. Today, please enjoy these images of our RedBubble merchandise in the wild. You too could look this happy, if only you had ordered an “I Can Get Better with Practice” Dragon shirt. 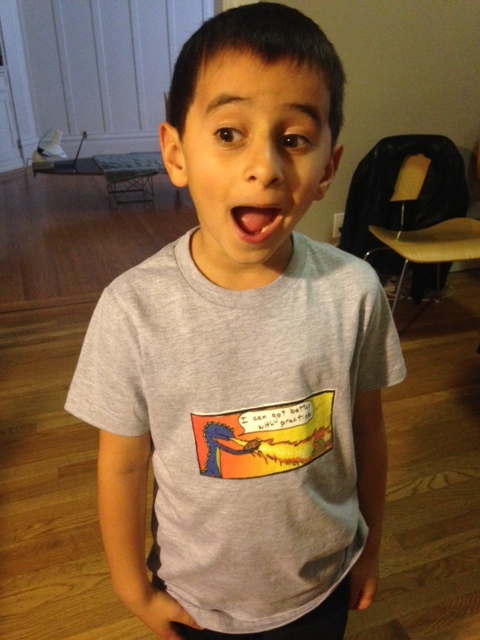 My nephlings got QWERTYvsDvorak shirts for the holidays, those lucky kids. Pictured here, this handsome fellow models the Dragon Comics “I Can Get Better with Practice” panel T-shirt, kids size, gray. “I can get better with practice,” is, of course, our motto. Words to live by, folks. Princess Sealestia of Aquastria reigns supreme over the underwater world. 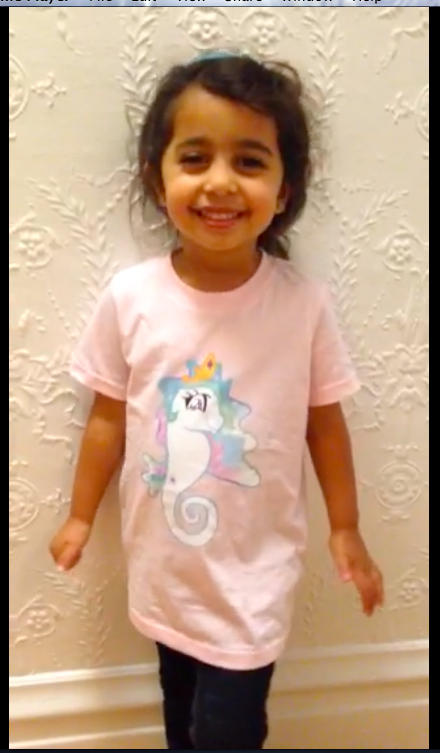 This lovely little lady is obviously enjoying the glamour and style of the kids pink “Princess Sealestia of Aquastria” T-shirt. There’s still a little time to order for Christmas, if you get express shipping. Your children could be almost as adorable as these kids. I mean, being incredibly good-looking and unspeakably talented runs in the family, obviously. I can’t guarantee that your kids will be just as adorable, but they can certainly be just as well dressed. This entry was posted in Clothing and tagged clothing, comic, dragon, family, fire, mlp, my little pony, practice, princess celestia, redbubble, sea horse, t-shirts on December 23, 2014 by littledragonblue. Sometimes all you need to change your point of view is a short walk. Sometimes it doesn’t change your point of view at all. This entry was posted in Uncategorized on December 22, 2014 by littledragonblue. Apparently people are enamored of “the machine.” Personally, I think it’s kind of a mean-spirited device. It gives you *almost* what you want, but not quite, because it delivers the thing you want in such a way that you almost don’t want it anymore. You would be better off without its generosity. At any rate, a machine this powerful probably can’t be destroyed, although it can be stored in the guest bedroom with all the craft supplies and exercise equipment you never use, buried under antique furs and baby toys and ugly prints inherited from long-dead great-aunts. Dragon’s Cave, unlike my house, offers unlimited storage space, so there’s no question of setting the machine on fire on the front lawn. Just so you know, the otter will share the doughnuts with the fox and the girl and the boy. He can’t eat that many doughnuts himself. Although I suspect the real otter would have no problem taking doughnuts from a kid for the sake a big laugh. But I’m sure he would give them back later. I feel like the fox is as much a victim of this prank as the little girl, but something about the way he’s drawn suggests that he knew this would happen and he’s in on taunting the kid. But that’s not the kind of fox he is, I swear. I wanted to give him the punchline in panel 4 but nothing sprung to mind, so there it is. He’s just watching, feeling relatively certain that the otter is just messing with him and will dole out the doughnuts soon enough. Also I like the kid perspective: the girl did suffer, as only a child denied is capable of suffering. 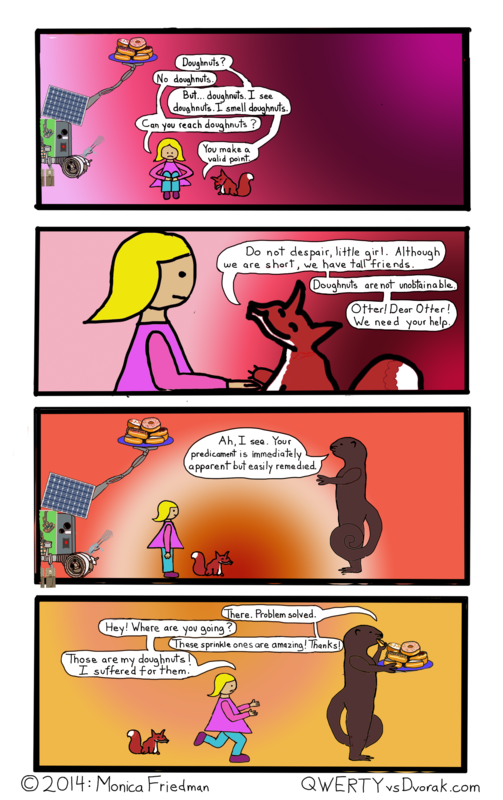 This entry was posted in Comics, Dragons and tagged comics, doughnuts, dragon comics, fox, girl, machine, mean spirited, otter, prank, ragon, vertically challenged on December 19, 2014 by littledragonblue. I really like this 5-pointed mandala. Mandalas with odd numbers of sides are such rebels. This one has a high degree of skew to it, but it seems like that effect is mitigated by the lack of lateral symmetry. That’s all I have to say on the subject of this mandala, but if you are still reading, I’d like to say a few words about giving to charity. A lot of people save their big charitable donations for the end of the year, and while we should probably support charities all year round, I’m guilty of this myself. Although I don’t have a lot of money, I do try to give. My top charity is Love146. Did you know that in the US alone, it’s estimated that 100,000 children live in sexual slavery? Can you even imagine what the global number of trafficked and exploited kids is? Love146 helps rescue children from sexual slavery. It provides safe homes and good food and useful education and psychological support for children whose lives might have been thrown away and restores these kids to the world. It teaches them that they have value and a purpose of their own and offers them new families to protect and care for them so that they can grow up strong and healthy. I’m also enamored of Heifer International. I first encountered this group in my first real job out of college. I worked in a satellite office and one year, right before Christmas, I received a card from a woman in the main office, a woman with whom I worked over the phone and online. The card explained that a goat had been donated in my name. A goat! How can you not support that? If goats aren’t your thing, you can donate chickens, or bees, or rabbits, or alpacas, or basically any useful farm animal, in your friends’ names. Are you rich? You can give a water buffalo! People’s lives are changed through these donations; a starving family with a chicken suddenly has food and a business. Furthermore, donees are required to donate some of their animal’s offspring so that the entire village eventually benefits from your gift. Charity:Water is another worthy group. They dig wells in remote villages. This is bigger than it sounds. In a lot of third world countries, drinking water is not immediately accessible. It typically falls to women or children to walk miles to the nearest source of water, and this water is often not clean by American standards. Further, it can be dangerous for women and children to be walking at all in some of these regions. So your 11-year-old daughter might spend 4 hours a day fetching and carrying muddy drinking water. Or she might never come home because you live in a war zone. I believe this group also builds bathrooms in remote regions. You cannot imagine how dangerous it is for women and children to relieve themselves in certain parts of the world, not to mention how difficult it is to practice any sort of hygiene without running water and plumbing. Doctors without Borders/Medecins sans Frontieres send emergency medical assistance in the wake of natural and manmade disasters, often risking their lives to help others. Their quick response time mitigates humanitarian crises, saves lives, and can prevent epidemics from spreading. They’re a fairly well-known medical charity, and I’ve supported them for a while. A slightly less well-known medical charity, Partners in Health, maintains clinics in places where medical care is difficult to access. They have been especially effective in treating chronic tuberculosis around the world. I learned about this group, and its amazing founder, Dr. Paul Farmer, after meeting the wonderful writer Tracy Kidder and reading his Pulitzer-winning book about Dr. Farmer, Mountains beyond Mountains. I can’t recommend this charity, or this book, enough. Paul Farmer is one of the most inspirational people about whom you will ever read, if geniuses giving selflessly and tirelessly inspire you. The Southern Poverty Law Center does excellent work in tracking hate groups and, whenever possible, taking them to court. Their mission is to fight for civil rights, and generally speaking, the people they are fighting against are Nazis, or people whose politics and beliefs are so aligned with Nazis that it’s hard for the rest of us to perceive the difference. They also produce a lot of teaching tolerance material. But seriously, they fight Nazis. Unless you are a Nazi yourself, I have trouble understand how you could not support this mission. Whenever I see the banner ads on Wikipedia, I send them $5. A lot of people ignore these pleas for donations, but Wikimedia is, after all a charitable organization, and their mission is nothing less than making the sum total knowledge of humankind available for free to everyone in the world. This is a noble goal, and furthermore, whether we admit it or not, most of us use Wikipedia on a regular basis. Yes, I know, people criticize the site and question its reliability and insist that it’s not a good academic source. Perhaps, but it’s a great general source. It’s an encyclopedia. You’re not supposed to cite encyclopedias anyway. You use them to get a grasp of a new subject, to learn an overview and pick up keywords to find more specific information. Bonus: you want original sources? The entire bottom of the page is nothing but links to original sources. If you don’t think Wikipedia is a) hugely useful and b) hugely important, you’re either lying, or not on the Internet, or lack curiosity. I’m there almost every day. And finally, I always send a few bucks to Planned Parenthood. I could talk about how they provide reliable and affordable healthcare to millions of women. I could talk about how they subsidized, for many years, birth control I could not otherwise afford. I could talk about their educational programs. But mostly, I donate to stick it to those kneejerk fundamentalists who go around with giant anti-abortion banners, people who are so in love with their own ignorance that they’re completely unaware of what the Bible actually says about abortion (hint: a fetus is considered the property of its parents, not a living being. Look it up. Or don’t. I’m well aware that people don’t like to see reason on this issue) and so unaware of their own hypocrisy that the second that unwanted child is forced into the world, they’re ready to condemn it for being poor, being gay, and so on. There are seven billion people in the world and millions of unwanted kids languishing in social services. If you want to protect a kid, try helping one that’s already here. 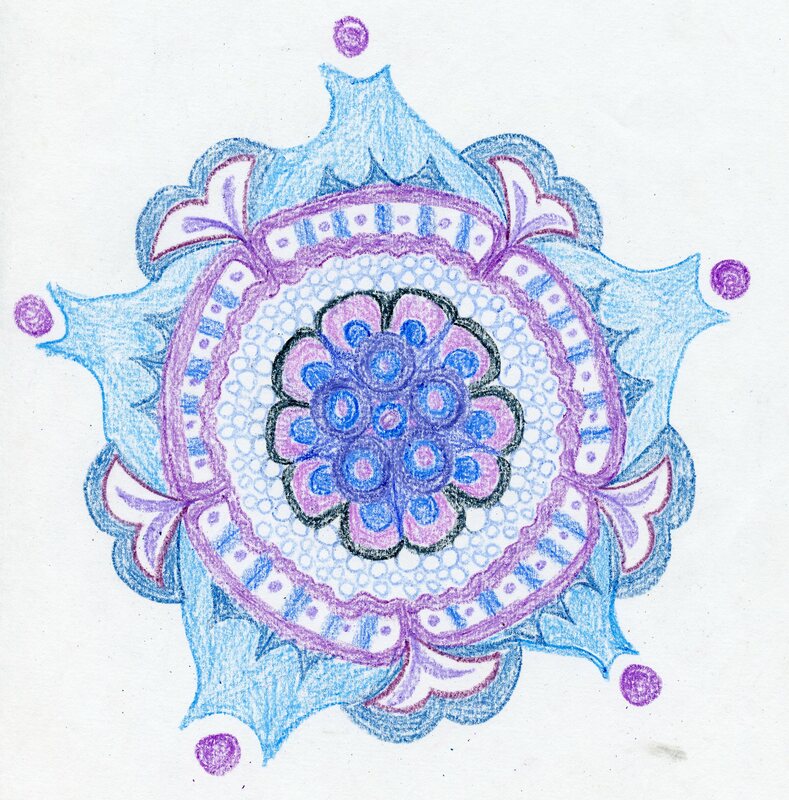 This entry was posted in mandalas and tagged charity, charity:water, doctors without borders, donation, giving, heifer international, love146, mandalas, partners in health, planned parenthood, wikimedia foundation, wikipedia on December 18, 2014 by littledragonblue. Some things are just over her head. It’s late. I’ve been drawing all day while gorging on gingerbread and forgot that I’d never scheduled this post even though the comic was drawn last weekend. Also today I sliced off the top millimeter of my left thumb with a knife. This never happens. I never cut myself with knives. Tin can lids, broken tiles, shards of glass, sure, I injure myself with those things all the time. But usually I’m in total control of a kitchen knife. Now my thumb is a minor inconvenience, I’m sick from too many cookies, and it’s late. 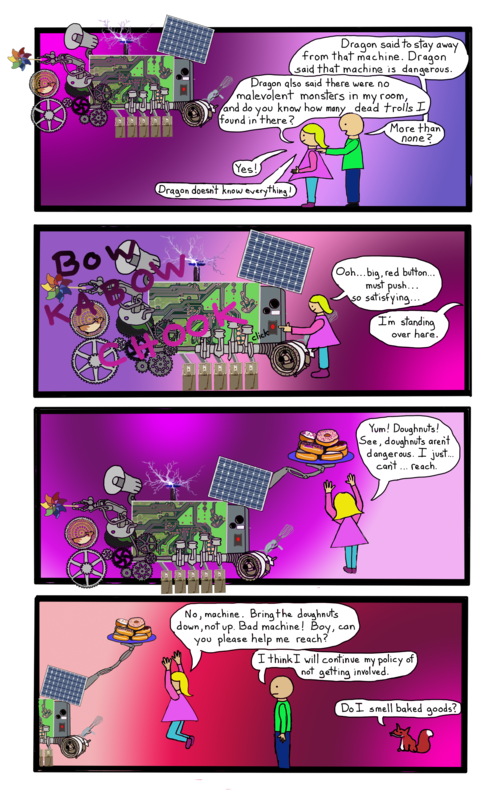 This entry was posted in Comics, Dragons and tagged doughnuts, dragon, fox, girl, machine, webcomic on December 17, 2014 by littledragonblue. My brother emailed me asking if I could send him a high-res version of “My Nephew Goes Wading,” the little doodle I scrawled out a while back when I was working on “My Sister and Brother-in-Law Look to the Future.” I sent him the files but really, it was just a scribble. I always meant to paint it. He wanted an art print or something! It was just a few lines. So, the last few days have been dedicated to fleshing it out. It’s hard to accurately capture the joy on his face. It’s not quite 100% satisfactory yet. In small format it looks good but for a blown up version it’s not quite there. Maybe in the next day or so. Digital paint has a lot of advantages over real paint; it’s less messy, and it’s easier to take back, paint over, or adjust mistakes. It’s cheaper. It smells better. But…it’s still nice to have real materials (which I can’t afford right now so whatever). Painting is for the wealthy, or for people with patrons. Anyway, “My Nephew Goes Wading, Redux.” I can get better with practice. I know I can. This entry was posted in art, Digital Paint, paint and tagged boy, digital paint, family, happy, nephew, painting on December 16, 2014 by littledragonblue.